Isn't that a beautiful 335? I've never seen one that was so gorgeous. Simply incredible. What's the finish called? I'm assuming something like this would have to be ordered through the Made to Measure program? It's got to be a custom order, alright. I've never seen anything like it. I assume the MTM Program is a one-time build through the Custom Shop? It's actually a 2016 ES-335 Figured in Faded Light Burst. Their seems to be a lot of variance in the amount of flame and coloring in that particular model. A little less red in the finish, and not quite as flamed, but still very nice. In reality, all but one of those instruments was purchased mainly to acquire the distinctive natural voice that each of them has going for it. The last one I got was the Telecaster, out in front of the rest. 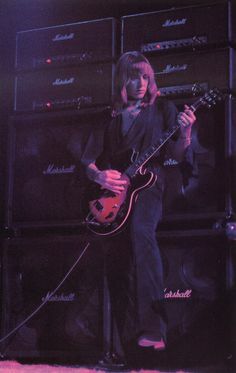 The bridge pup sound of that one was something I didn't feel I needed-- right up until I started covering the work of James Honeyman-Scott and the Pretenders. It was just a couple of months into that project when I realized: some things, you simply do need a Telecaster for. Since then, it has become one of my two most favorite guitars. The only instrument in the photo that I did not buy primarily to acquire its distinctive natural voice was that ES 339. In the case of that guitar, I bought it to use as a substitute for the ES 335, which I was having a hard time with at that point in time. I was distracted to no end by the oversize body of the ES 335, and mine has a fairly slender fretboard that didn't serve me well until I had been playing for 3 or 4 years. In a way, that ES 339 is kind of my "baby guitar" as it was the first guitar I was totally comfortable with. But after a couple years of practice, I suddenly found that the ES 335 wasn't so hard to play after all. But still, the instrument doesn't feature a really standout or trademark sonic character when played clean with no effects. It does have a very sweet neck, though... and sentimental value, for whatever that's worth. So it's acceptable enough... but not a total favorite these days. I mostly just use it for stuff that calls for open tuning. LOL One of my ex-wives calls that guitar my "Rain Song" guitar, since that's the only thing she's ever heard me play on it. If you say so. Yours is just killer! I've never laid eyes on such a beautiful 335, and rarely on a LP with that kind of top. Is it solid, or a veneer? That LP with the spalted top is MUNCHABLE! 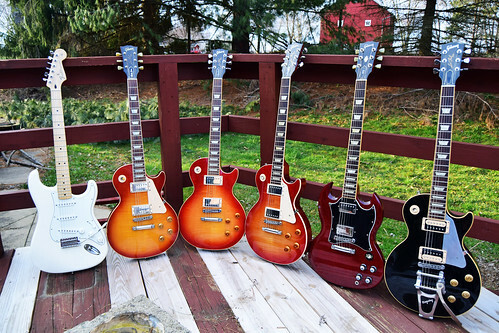 I'm a simple man, my dream guitar would be a Gibson Les Paul with all 1959 VOS, honeyburst with a plain maple top showing a little bit of curly flame like the one above (not mine, wish it was though...). Amber inlays, yellowed Gibson logo on headstock. Somehow it will have a little bit of weight relief as I have back problems..! Dream guitars but I also own them. Vintage Gibson's including a pair of great conversions.